How do I train my dog to wear boots? 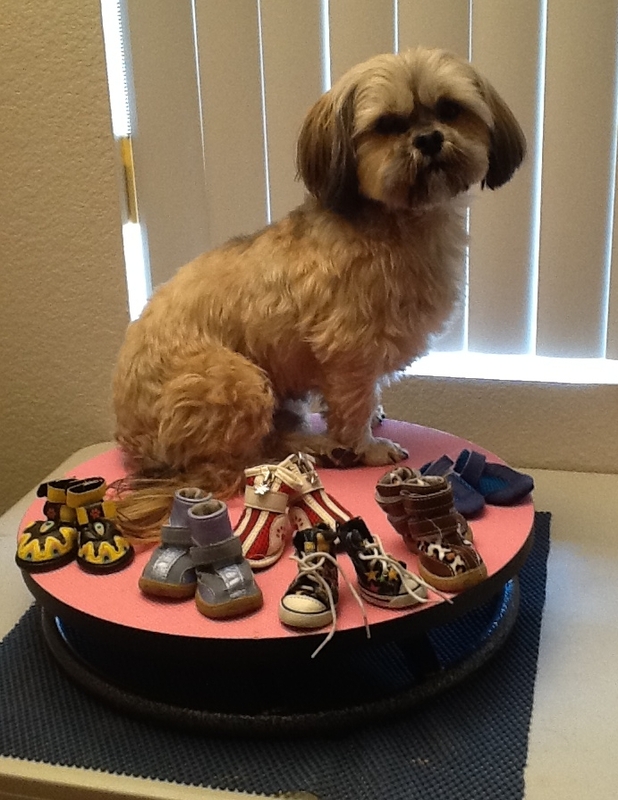 The trick to training your dog to wear shoes is through positive reinforcement, proper sizing and patience. Buying dog shoes and slapping them on your dog's feet and laughing at them while they panic is not the way to introduce your dog to footwear. Their FIRST experience with shoes will be the one they remember. Although your laughter will be very difficult to control, please try to refrain. It is best to use a 'high value' treat while training. To some dogs this may be a piece of chicken. To others it could be a special toy. Be consistent. Do your training in the same way, in the same sequence, every time. Put the boot on the floor and let him check it out. When he shows interest and starts to sniff it, give him a treat. Take the boot and let him sniff it- and give him some of his treat. (Choose his favorite treat and use it ONLY for this shoe training) Run the shoe gently in his foot- then more treat when he lets you. I would then switch gears on him so he would not get fixated on what is happening. After a bit, take the boot (and this is the important part) put it on one foot, treat him and take it off immediately and treat him. Your dog should be pleasantly perplexed. Praise him and act like the shoe is the greatest thing in the world and HE let you put it on his foot! Try then same sequence again. He sniffs the shoe as you hold it up to him, treat, put one on his foot, treat, take it immediately off his foot- treat. He has to know letting you put it on is as good as letting you take it off. This is enough for the first day. Take him to his special place where you want to put his boots on. This should be a separate location he can count on as his business spot - perhaps a place where he gets groomed and taught things. Have you noticed that hiding his brush/comb by your recliner to spring on him after he hops in your lap for relaxation doesn't work? Make sure not to get down on the floor with a little dog. They will think it is playtime. Dogs do no like to be BS-ed. It might work once, after that it's "Fool me once, shame on you, fool me twice, shame on me". Dogs are very smart! Put the first shoe on- Treat, praise, and make it like it's the biggest party in town! THEN put on another shoe (if he's getting the idea) using the show, sniff, TREAT, put on shoe, TREAT.... then take off BOTH shoes and give a 'jackpot treat', i.e. a bigger amount of his treat. That is enough for day two. Then do the same with the back feet. TREAT BIG TIME! He let you put all 4 on! Now if he is as happy about it as you are, go ahead and put him on the ground. TREAT as soon as he hits the ground. Don't give him time to think about anything else other than he has things on his feet and he gets TREATS. My key training tip is, "IGNORE the behavior you don't want (meaning, no treat given)' reward the one you do"
Now walking around funny in his boots for the first time is not panic. He's getting a feel for them and they are adjusting a bit to his foot. If he panics, you will know it. But with patience and following these instructions he should be in all four and walking in a week. Just do this when YOU are not rushed and have time. 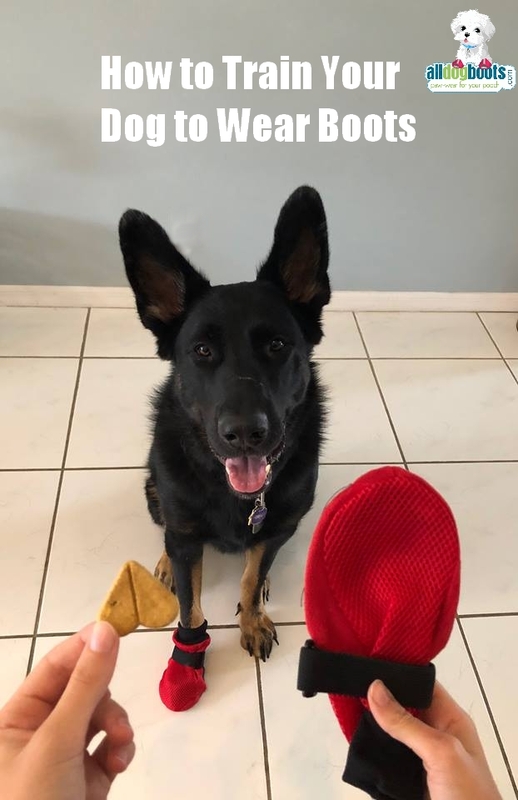 As animals think in pictures and emotions, it helps to visualize a happy dog with his boots on getting his favorite treat. 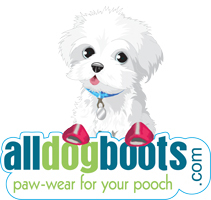 Before you know it, your dog will be bringing you his boots for you to put on when it's time to go outside!